SKS Bicycle Accessories. Gearing up your touring bike. We’re going to start a series of threads discussing all the accessories you can think of when it comes to touring bikes. We welcome comments if you’ve owned, seen, or use any of the accessories we mention. If you have other recommendations, post them in the comments. 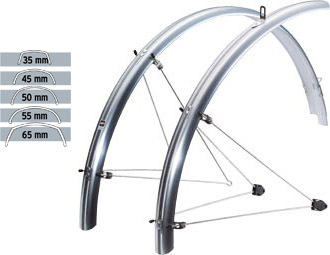 Fenders are nearly essential accessories for your touring bike. They will protect your gear from water and mud, and also keep your components and backside clean. There are a couple of types of fenders, so let’s take a quick look at them. Full-length: These fenders typically wrap around most of the tire, leaving about 6 inches of ground clearance on the rear wheel, with less coverage up front. Clip-on: These usually clip on to the seat post and are completely useless, don’t buy them unless you are in the unfortunate situation where you don’t have fork or brake clearance for full-length fenders. Mudflaps: These are really just extensions for short fenders and give a little extra protection. I ride with SKS fenders on my Surly because they are well-designed, cheap, and rugged. I’ve installed the P50 model because they are designed for the 700cc tires and can accommodate tires up to 700 x 45! Here is a sizing chart. They retail for about 30-40 US dollars. Lots of support posts and sturdy, easy install. No Problems. Made of a aluminum wrapped in a tough plastic that makes them strong and flexible (called Chromoplastic I think). Adjustable supports too.